Ian Millar of Perth, ON, won a team gold medal and tied for 16th individually in his record tenth Pan American Games appearance riding Dixson, owned by Susan and Ariel Grange. Equestrian competition officially came to a close at the TORONTO 2015 Pan American Games with the individual final in show jumping taking place on Saturday, July 25, at the OLG Caledon Pan Am Equestrian Park in Caledon, ON. Ten-time Canadian Olympian Ian Millar of Perth, ON, hometown athlete Yann Candele of Caledon, ON, and 2008 Olympic Champion Eric Lamaze of Schomberg, ON, contested the individual final for Canada. Canada had claimed the gold medal in Thursday’s team competition, also earning Olympic qualification, with all four members of the Canadian Show Jumping Team producing impressive results. The top 35 athletes move forward to the individual final, however, nations are restricted to sending their best three ranked riders. That meant Tiffany Foster, 31, of North Vancouver, BC, cheered her teammates on from the sidelines, despite being ranked 18th individually with Tripple X III, owned by Artisan Farms LLC. In his record tenth Pan American Games appearance, Millar emerged as the highest-placed Canadian individually following two tough rounds of show jumping competition at Olympic standard. Riding Dixson, a 12-year-old bay Belgian Warmblood gelding (Vigo d’Arsouilles x Olisco) owned by Susan and Ariel Grange, Millar incurred eight faults in the opening round. The pair improved to a four fault effort in the second round, which saw competitors tackle a new track set by Canadian course designer Michel Vaillancourt, individual silver medalist at the 1976 Montreal Olympics. With a final score of 13 faults over two rounds, Millar ended his tenth Pan American Games bid tied in 16th position. 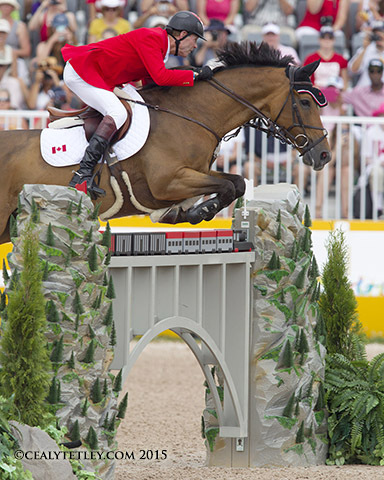 A total of 50 athletes contested the show jumping events at the TORONTO 2015 Pan American Games. Following a two-horse jump-off for the gold medal, Mclain Ward of the United States riding Rothchild won over Venezuela’s Andres Rodriguez and Darlon van Groenhove. Another jump-off to determine the bronze medal saw Lauren Hough of the United States emerge on top riding Ohlala. “I said to the team that it was a good thing we got a medal on Thursday!” said Millar, 68, who was the Pan Am Champion in 1987 and 1999. “When we come to these things, the team event is the most important thing. That’s what we want is the team result. It’s what we need for the Olympic qualification. That was the big job. It doesn’t mean that we let down today, it just didn’t happen. Candele finished in 19th position individually with a two-round total score of 16 faults. Riding Showgirl, a 15-year-old chestnut selle francais mare (Gold de Becourt x Elf III) owned by the Watermark Group, Candele incurred eight faults in both rounds. In Thursday’s team event, Candele and Showgirl delivered the best scores of the Canadian Show Jumping Team. Less than two years ago, a group of committed owners came together under the name Watermark Group to purchase Showgirl for Candele on the advice of 2008 Olympic Champion Eric Lamaze. Lamaze had an unexpected stop on course during the first round riding Coco Bongo. As the pair entered the opening element of the triple combination at fence 11, Coco Bongo hung up in the air, coming down on the back rail. As a result, they could not make the distance to the ‘b’ element. The eight jumping faults and two time penalties left Lamaze in 22nd position individually, just missing the cut for the second round. Having built his business, Torrey Pines Stable, in nearby Schomberg, ON, competing at the OLG Caledon Pan Am Equestrian Park was something of a homecoming for Lamaze. The Canadian Show Jumping Team was led by chef d’equipe Mark Laskin, Team Manager Karen Hendry-Ouellette, Team Veterinarian Dr. Sylvie Surprenant, and Stable Manager Darren Roberts. The Canadian Equestrian Team claimed a total of five medals at the TORONTO 2015 Pan American Games, helping Canada set a record for the most medals earned in Pan American Games competition. Canada won team silver in dressage with an individual bronze for Chris von Martels; eventing won team bronze with an individual silver for Jessica Phoenix, and show jumping took the team gold medal for the first time since 1987.